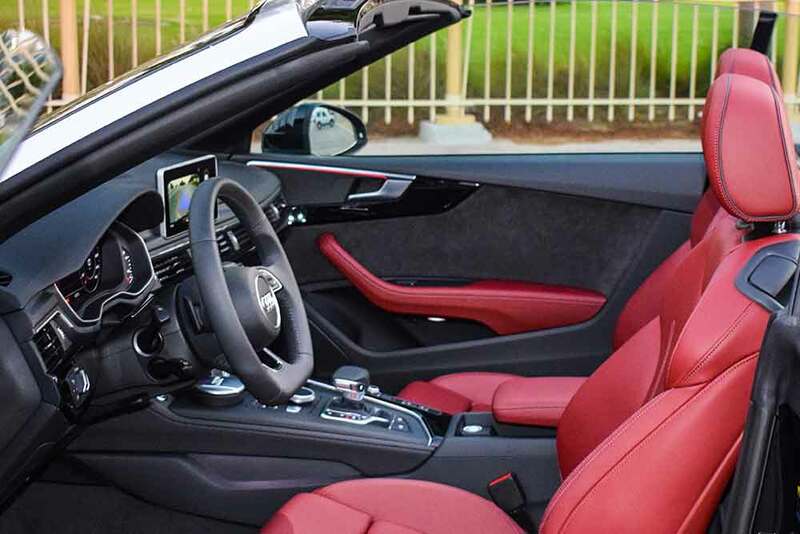 The distinguished Audi A5 Cabriolet design aesthetic continues throughout the cabin of the vehicle, combining comfort and sophistication to create an exhilarating environment for drivers and passengers alike. Audi has done an amazing job refining the A5 for its second generation. The updated corporate grille is now proudly displayed, giving the A5 a far more modern touch. The LED headlights and daytime running lights are equally vogue. Nice details like the creased hood lines and sweeping character line over the fenders makes the car look hewn from a solid chunk of aluminum. Adding to the upscale appearance are the optional 19-inch Design Line wheels on my tester. They replace 18-inch, 10-spoke, turbine style wheels that are far less interesting. The two-tone 19s contrast nicely with the Florette Silver Metallic paint and black soft top. With the top stowed, the Nougat Brown interior continues the premium aesthetics. The more angular design for 2018 continues around back, where the taillights now have a more purposeful shape, leaving behind the somewhat soft and rounded look of the previous version. Twin, chrome-tipped exhaust pipes match the chrome badging on the trunk and trim work that wraps around the lower edge of the bumper. Audi is rather conservative with chrome on this cabriolet. Aside from that out back, there is some satin chrome on the windshield hoop and bright chrome on the grille and along the base of the side windows. 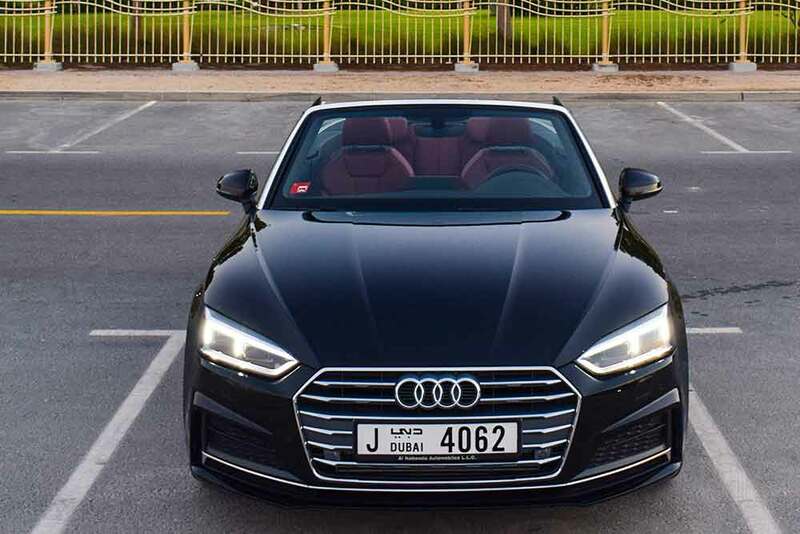 Hire Audi A5 in Dubai, we strive to provide the best service in the area. At Rotana Star , we have many years of experience in the hire car field. As a result, we can bring value for money and top-notch service – guaranteed. A key reason for this is because we own our entire fleet of vehicles. This means we have more flexibility on price, unlike our competitors, who often lease their cars on a long-term basis. At Rotana Star, we make the process to Drive a Audi A5 in Dubai for rent easy. The first step is the browse our website to find a suitable price. After this, contact us by sending in a request via our online form or by telephone. We aim to get back in touch soon after to finalize the deal. When the time comes to deliver the car, we offer two options: either pick-up the car from our Dubai showroom or take advantage of our popular door-to-door delivery service. Our premium car rental services allow you the chance to rent a Audi A5 in Dubai or other luxury brand cars at affordable rates. Book online or over the phone and collect your rent a car or get it delivered in Dubai.